2018 brought Warbler Wave (see post below) and Thank You, Earth. New in 2019 will be three books: BLOOM BOOM, my latest photo-illustrated book from Beach Lane/Simon & Schuster, celebrates plant growth, wildflower bloom, and botanical garden tulip/daffodil display. It arrives Feb 2nd in time for Valentines Day! Kirkus already gave it a starred review! Then it’s LIKE A LIZARD, illustrated by Stephanie Laberis, from Boyds Mills Press. It’s a preschool imitate-and-learn fest for young readers and reptile fans. Finally, there’s DID YOU BURP? 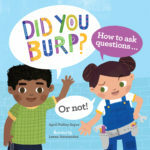 How to Ask Questions (Or Not) in early August, illustrated by Leeza Hernandez for Charlesbridge Publishing. It’s a unique nonfiction/fiction mix that allows kids to play with question forming via a group of fictional characters in a classroom setting.